In 2010, I defined a discussion arc, in philosophy, as a curve displaying the relative frequency at which a term or phrase appears among the abstracts of philosophical articles. Since then, I've done a few analyses using discussion arcs, mostly searching for philosophers' names (here, here, here, here, here). Today I thought it would be fun to look at philosophical jargon -- its rise and fall, how much it varies over time, and as a measure of what is hot. Maybe you'll find it fun too! I rely on abstract searches in The Philosophers Index. 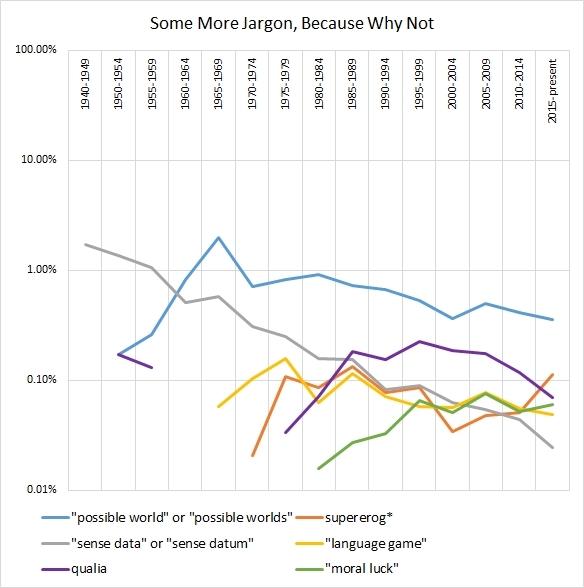 NGram is nifty, but it doesn't do well with trends specifically in academic philosophy (see here). JStor is interesting too, but it's a limited range of journals, especially for articles less than six years old. First, I constructed a representative universe of articles (limiting the search to journal articles only): In this case, I searched for "the" in the abstracts, in five year intervals from 1940-present, except merging 1940-1949 for smoothness and a large enough sample. Then I searched for target terms in abstracts in the same five-year intervals. I constructed the curves by dividing the number of occurrences of the target term by the number of articles in the representative universe in each period. Evolution*, though it approximately triples over the period, has a Max/Average Ratio not too far from one. Democra* rises from a substantially lower level of discussion than does evolution* and has a higher Max/Average Ratio. 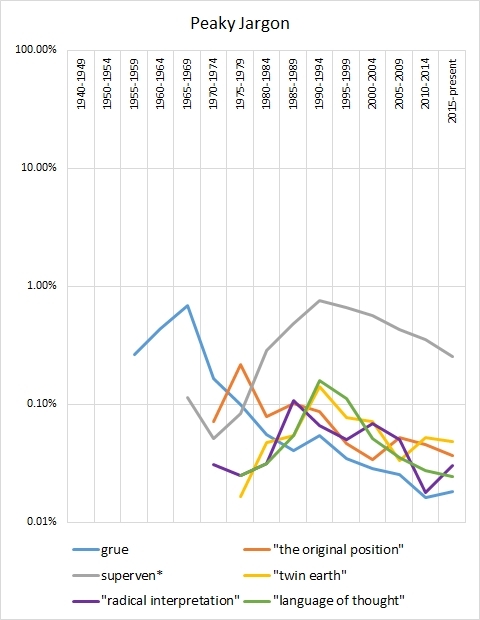 Induction crashes down to about a sixth of its initial level of discussion (0.174% in the first four periods to 0.028% in the final two) -- hence its moderately large ratio. Now let's consider some jargon terms that more clearly reflect hot topics. Since the scale is logarithmic, periods of zero incidence are not charted. Also remember that logarithmic scales visually compress peaks relative to linear scales. For example, though the decline of "language of thought" is not so visually striking, usage was in fact about seven times as much at peak as it is now. "Grue" was introduced by Nelson Goodman to describe a puzzle about how we know the future in his "New Riddle of Induction" in 1955. As you can see from the chart, discussion peaked 10-15 years later, in the late 1960s. 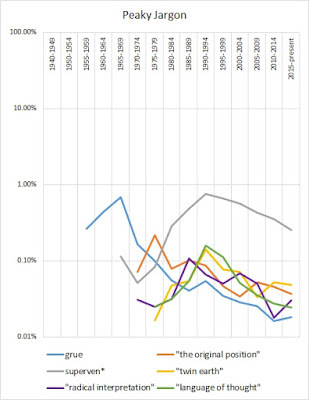 "The original position" was introduced by John Rawls in his 1971 A Theory of Justice, describing part of an idealized decision-making process, and discussion of it peaked in the late 1980s, about 15 years later. "Supervenience" has a murkier origin, but was popularized in philosophy by R.M. Hare in 1952, to talk about how one set of properties might covary with another (for example the moral and the physical). Discussion peaked about 40 years later in the early 1990s. Hilary Putnam introduced "Twin Earth" (a planet with XYZ instead of water) in a thought experiment in 1975, and discussion peaked 15-20 years later in the early 1990s. "Radical interpretation" was introduced by Donald Davidson in the early 1970s, peaking 15 years later in the late 1980s. Finally, the "language of thought" was introduced by Jerry Fodor in his 1975 book of the same title, peaking 15-20 years later in the early 1990s. With the exception of supervenience -- maybe partly because the concept took some time to transition from ethics to the metaphysics of mind -- the pattern is remarkably consistent, with peaks about 15-20 years after a famous introduction event. This pacing reminds me of my earlier research suggesting that individual philosophers tend to receive peak discussion around ages 55-70, despite producing their most influential work on average about 20 years earlier (NB: the two data sets are only partly comparable, but I'm pretty sure the generalization is roughly true anyway). This is the pace of philosophy. The Max/Average Ratio, of course, doesn't really capture rising and falling; and the ratio will be inflated for more recently introduced terms, assuming virtually zero incidence before introduction. For a better measure of peakiness, we can examine the ratio of the maximum discussion to the average discussion in the first two and final two time periods. To avoid infinite peakiness and overstating the peakiness of rare terms, I'll assume a floor level of discussion of .01% in any period. Call this Peakiness with a capital P. Five of the six topics in the first group have a Peakiness between 1.3 and 2.0, and evolution* has 2.9. Grue was hot! Although its peak discussion was about the same as superven*, it has crashed far worse -- or at least it has, so far. If we had a longer time period to play with, we could try to make the analyses more temporally stable by sampling a window of 50 years before and after peak, thus giving superven* more of a fair chance to finish its crash, as it were. Okay, how about newer jargon? Let's try a few. I guess first I should say that jargon is wonderful and valuable, and I actually love the grue and Twin Earth thought experiments. Also some jargon becomes a permanent part of the discipline -- such as "dualism" and "secondary qualities". Maybe grue and Twin Earth will also prove in the long run to be permanent valuable contributions to the philosopher's toolbox, just in a lower-key way than back when they were hot topics. I don't really mean "jargon" as a term of abuse. 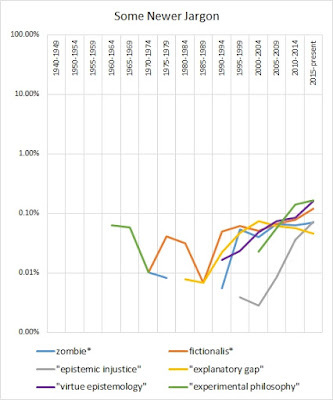 In 1974, Robert Kirk introduced "zombies" in the philosophical sense (entities physically indistinguishable from people but with no conscious experience), but usage didn't really take off until they got discussion in several articles in Journal of Consciousness Studies in 1995 and in David Chalmers' influential The Conscious Mind in 1996. Contrary to popular rumor, the zombie doesn't appear to be dead quite yet. "Epistemic injustice" was introduced by Miranda Fricker in the late 1990s and early 2000s. "Virtue epistemology" was introduced by Ernest Sosa in the early 1990s. Fictionalism has a longer and more complicated history in logic and philosophy of math. The "explanatory gap" between physical or functional explanations and subjective conscious experience was introduced by Joseph Levine in 1983, but doesn't hit the abstracts until some papers of his in the early 1990s. "Experimental philosophy" in its earlier uses refers to the early modern scientific work of Newton, Boyle, and others. It's recent usage to refer to experimental work on folk intuitions about philosophical scenarios hits the abstracts all at once with five papers in 2007. Consistently with my twenty-year hypothesis, of these, "explanatory gap" is the only one that shows signs of being past its peak (despite hopes expressed by some of my Facebook friends). Maybe fictionalis* is running longer. Okay, I can't resist trying a few more discussion arcs, just to see how they play out. "Possible worlds" goes back at least to Leibniz, but its first appearance in the abstracts was by Saul Kripke in a 1959 article. It peaks at 2.0% in the late 1960s, but has enduring popularity (currently 0.4%). "Sense data" as the objects of perception was introduced in the early 20th century by G.E. Moore and Bertrand Russell and has lots of discussion in the beginning of this dataset (1.7%), crashing down to levels appropriate to a historical relic (0.02%). "Qualia" has a couple occurrences early in the abstracts and traces back to C.S. Peirce in the 19th century, then hits the abstracts again with an article by Sydney Shoemaker in 1975, peaking in the late 1990s. 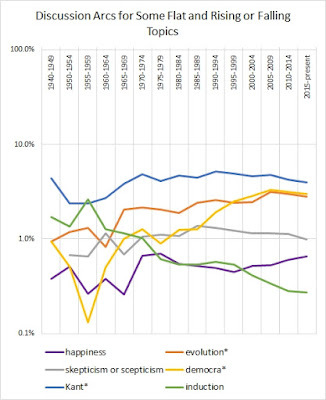 Supererogation (morally good acts beyond what is morally required) entered modern discussion in the late 1950s and early 1960s (first hitting the abstracts with Joel Feinberg in 1961), then peaked in the late 1980s -- but it looks like it might be staging a comeback? Wittgenstein introduced the idea of the "language game" in his posthumous Philosophical Investigations (1953), with discussion peaking in the late 1970s. 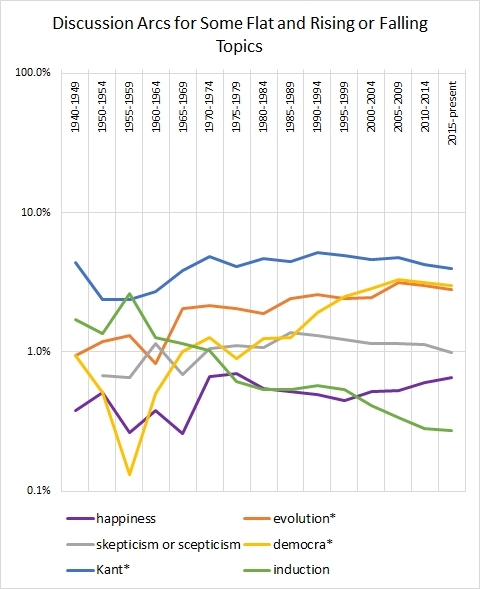 Thomas Nagel introduced "moral luck" in a classic 1979 article, and although it peaked in the late 2000s, it hasn't yet declined much from that peak. Possible worlds has the highest Peakiness of the lot -- though nothing like grue -- at 8.4. "Language game" is next at 5.1. The rest aren't very Peaky, ranging from 2.1 to 2.9. I've spent more hours this week doing this than I probably should have, given all my other commitments -- but there's something almost meditative about data-gathering, and the arcs yield a perspective I appreciate on the historical brevity of philosophical trends. 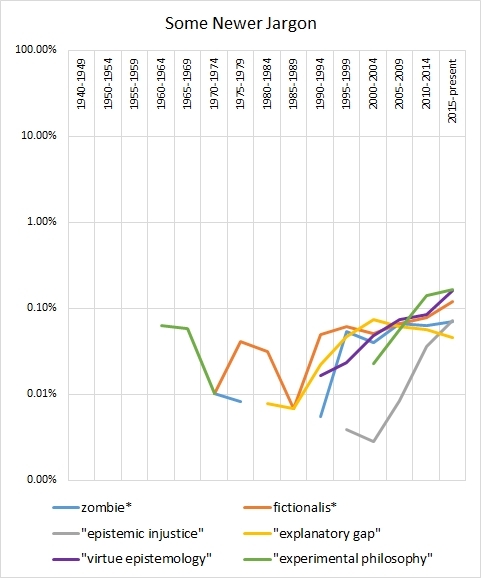 My book was written in 2005, so I guess it is due to peak in about 2 0r 3 years? Looking forward to it. Citations still rising, I think! I see a fair number from 2017-2018.